ALLIANCE consortium invites you to join the final conference of the ALLIANCE project “Sustainable urban interchanges: Trends and new prospects”, which will be held in Transport and Telecommunication Institute (TSI), Riga, Latvia on 17th October 2018. 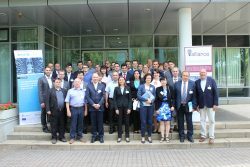 On June 19-22, 2018, the Institute for Logistics and Material Handling Systems of the Otto von Guericke University (OVGU) Magdeburg, in cooperation with Fraunhofer IFF and with the support of ALLIANCE project, hosted the 11th International Doctoral Students Workshop on Logistics. 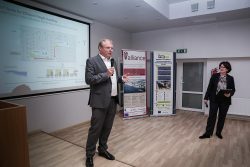 The Workshop was in the frame of the 21th IFF Science Days of the Fraunhofer Institute for Factory Operation and Automation. On May 30, 2018, Transport and Telecommunication Institute represented by Prof. 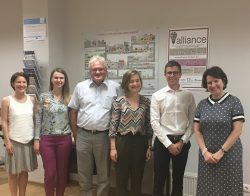 I. Yatskiv and Ms. K. Malnaca, in collaboration with the International Transport Forum (ITF), organized a discussion about road safety governance in Riga, Latvia. 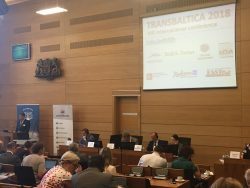 TTI researhers Prof. Irina Yatskiv (Jackiva) and Dr. Genadijs Gromovs took part in the XXI International conference “TransBaltica 2018”, which was held on May 31 in the premises of the Riga City Council. 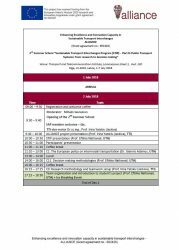 The 2nd ALLIANCE Summer School “Sustainable Transport Interchanges Program (STIP) – Part II: Public Transport Systems: from research to decision making” will be held on 1-7 July 2018 in Riga, Latvia.